The Plasma Physics Laboratory, founded in 1961, is one of the leading university laboratories for the study of plasma physics in the United States. There are four experimental facilities. 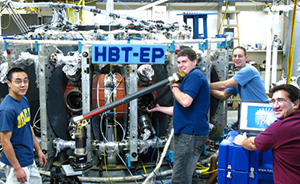 The Columbia High-Beta Tokamak (HBT-EP) supports the national program to develop controlled fusion energy. It utilizes high voltage, pulsed power systems, and laser and magnetic diagnostics to study the properties of high-beta plasmas and the use of feedback stabilization to increase the achievable beta. A collaborative program with the Princeton Plasma Physics Laboratory and the DIII-D tokamak group at General Atomics is studying the properties of high-beta plasmas in order to maximize fusion power production in these large, neutral beam-heated tokamaks and spherical tori. The plasma physics group and MIT conduct joint experiments with laboratory magnetospheres and advanced models for space weather and radiation belt dynamics. The stellarator known as Columbia Nonneutral Torus (CNT) conducts research on the magnetohydrodynamic stability, microwave heating, and microwave diagnostics of neutral stellarator plasmas. Two smaller devices investigate respectively an innovative tokamak-stellarator hybrid plasma confinement concept and the use of toroidal electron-heated plasmas as sources of ions for accelerators. The Columbia Linear Machine (CLM) is a continuously operating, linear mirror device for the study of collisionless plasma instabilities, plasma, transport, and feedback stabilization. Columbia’s Collisionless Terrella Experiment investigates plasma transport in magnetospheric geometry and the generation of strong plasma flow from nonlinear electrostatic potentials. Experimental research in solid-state physics and laser physics is conducted within the department and also in association with the Columbia Nano Initiative and the School of Mines. Facilities include laser processing and spectroscopic apparatus, ultrahigh vacuum chambers for surface analysis, picosecond and femtosecond lasers, a molecular beam epitaxy machine, and a clean room that includes photolithography and thin film fabrication systems. 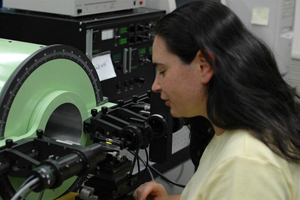 Within this field, the Laser Diagnostics and Solid-State Physics Laboratory conducts studies in laser spectroscopy of nanomaterials and semiconductor thin films, and laser diagnostics of thin film processing. The Laser Lab focuses on the study of materials under high pressure, laser surface chemical processing, and new semiconductor structures. Research is also conducted in the shared characterization laboratories and clean room operated by the NSF Nanoscale Science and Engineering Center (NSEC). The department maintains an extensive network of computing clusters and desktop computers. The research of the Plasma Lab is supported by a dedicated data acquisition/data analysis system, and the applied math group has access to a Beowulf cluster. Materials Science and Applied Physics built an intel-based 600 core computing cluster that is dedicated to performing first-principles computations of materials. Researchers in the department are additionally using supercomputing facilities at the National Center for Atmospheric Research; the San Diego Supercomputing Center; the National Energy Research Supercomputer Center in Berkeley, California; the National Leadership Class Facility at Oak Ridge, Tennessee; various allocations via XSEDE; and others. The Amazon Elastic Compute Cloud (EC2) is also utilized to supplement computing resources in times of high demand. Facilities and research opportunities also exist within the interdepartmental Columbia Nano Initiative, which focuses on complex films formed from nanoparticles, molecular electronics, and solar energy conversion, respectively. Modern clean room facilities with optical and e-beam lithography, thin film deposition, and surface analytical probes (STM, SPM, XPS) are available. More specialized equipment exists in individual research groups in solid state engineering and materials science and engineering. The research facilities in solid state science and engineering are listed in the sections for each host department. Facilities, and research opportunities, also exist within the interdepartmental clean room, shared materials characterization laboratories, and electron microscopy facility.